Mark So's Unlitrader Beta » What Is The Unlitrader And How Does It Work? What Is The Unlitrader And How Does It Work? Most traders focus on trading 1 to 4 currency pairs only and are happy making 90 pips when they trade. If that describes you and you can do it consistently, you are doing very well. However, did you know that most of the time, the big moves happen in the pairs that you would never imagine to trade? Take a look at the screenshot below. Highlighted in yellow are the results of AUD/USD and GBP/AUD respectively. In this example, if you traded AUD/USD, you would have made 70 pips, not bad. But can you see that in the same breadth of time, GBP/AUD made 136 pips? Twice the performance of the AUD/USD trade! Who would have thought of trading GBP/AUD together with AUD/USD right? Not a lot of traders. Because most traders have laser like focus when it comes to trading. They select a few pairs and stalk it like nothing else mattered. Although that is the typical way of trading and how most traders have trained themselves, it can limit a traders true potential. So how do I know what other pairs to trade to get the big moves? Simple. Trade everything you can in one go! As you can see in the screenshot below, which is the full screen shot of trades above, there were actually 20 trades that were made all at the same time. If you look at it, you can see the typical currency pairs like NZD/USD, USD/CAD, make 62 and 26 pips respectively, but if you look closer their counterparts namely NZD/JPY and CAD/JPY, those trades produced 171 and 165 pips respectively which is 2 and 4 times bigger! 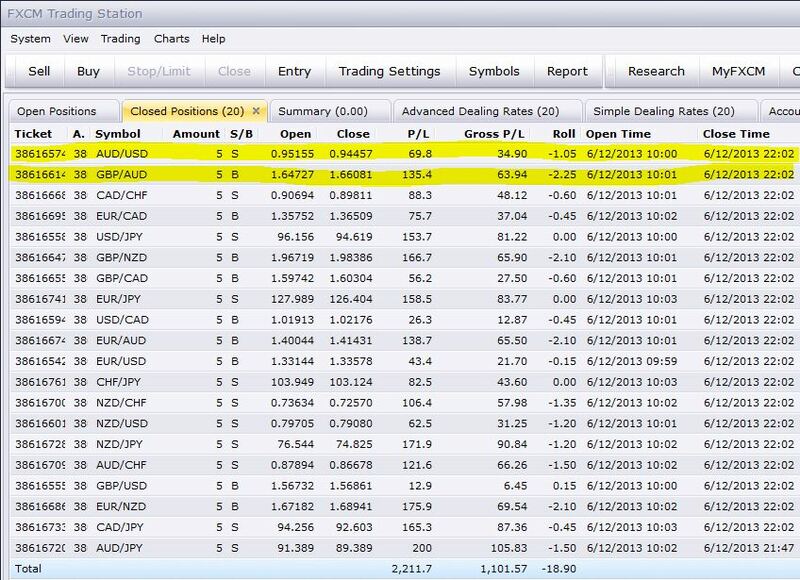 As you can also see, the total trade result was a massive +2,211 Pips or $1,101 in about 11 hours. Note: All the screenshots shown are actual live trade results of either our founder, Mark So or our subscribers. As with all types of forex trading strategies, past trade results are not indicative of future results. There will be wins and losses. These trades were not chosen at random. These trades and the directions were predicted using a system that Mark So developed from over 15 years of trading experience. WITH THE UNLITRADER SYSTEM, you can trade with up to 20 (or more) “mathematically connected” currency pairs all at the same time with the same amount of time it would take you to analyze a handful of currency pairs. Did you know that a movement in 1 currency affects at least 7 different currency pairs? Sophisticated and more experienced traders know this as “currency correlation”. Simply put, currency correlation is the relationship of one currency to another based on historical performance. For example, if the EUR moves up, CHF (a correlated currency) will also move up by a certain percentage. The problem with trading correlations is that it is not consistent over time. It has a tendency to change and is limited to only measuring historical data. What if there was a way to accurately determine the correlation of currencies before it even happens? After 15 years of trading, studying, and teaching Forex trading, Our founder, Mark So, discovered how to do just that. He discovered the mathematical and scientific bond between currencies which led him to develop a trading methodology he calls “currency deconstruction”. Using Currency deconstruction, Mark can see the trends of up to 28 currency pairs at any given time which allows him to multiply his trades exponentially. To harness the true potential of multiple trades, he further developed a software that allows his subscribers to multiply their trades as well—The UNLITRADER. 2. Get the latest trade forecasts and updates every 10AM / 10PM China Standard Time / GMT+8 or every 9AM / 9PM Eastern Standard Time. 3. An email reminder will also be sent out to you as soon as a new trade or update is made. 4. Use the Unlitrader Software To come up with multiple currency pairs to trade. 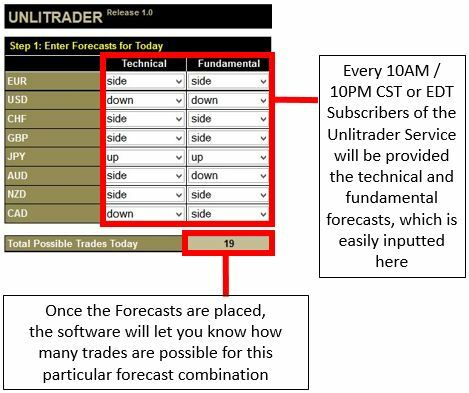 HOW DOES THE UNLITRADER SOFTWARE WORK? Subscribers of the Unlitrader copy service will be provided unlimited access to the Unlitrader software. Please click on video to start playing. The Unlitrader software uses a proprietary algorithm developed by our founder, Mark So. The algorithm is based on a trading methodology that Mark developed from over 15 years of spot currency trading which he calls “Currency Deconstruction”. Step 1: Enter the technical and fundamental forecasts. The forecasts will be provided by Mark throughout the week so all you have to do is “copy” the settings provided as part of the service. *If you are used to making your own analysis, you can put in your own combinations as well. Step 2: Enter the Trade Settings. Simply put in the Lot size, stop and limit figures per trade. These will also be provided to you, so you can just copy it. *If you are used to trading a bigger or smaller lot size, you can put in your own figures as well. Step 3: Enter Your Account Balance And Risk Settings. The software will then calculate how many trades you can take, how much your total possible losses are and total possible profits will be before you even trade. If you don’t like what you see, simply repeat steps 2 and 3 above to come up with a figure that you find suitable. 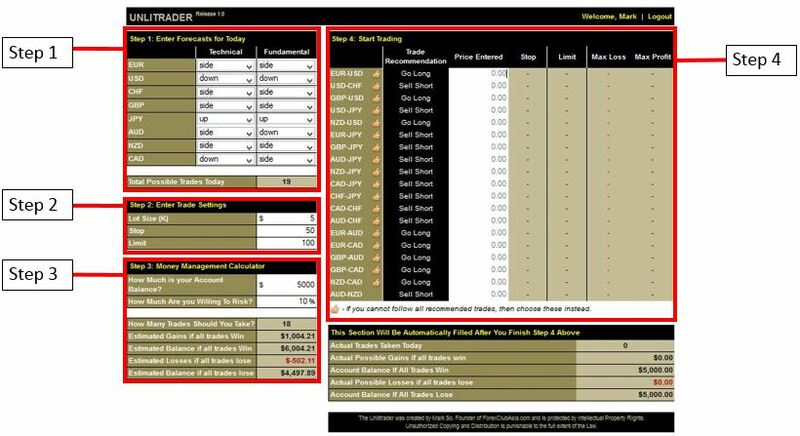 You will now see on the right side of the software the currency pairs and the trade recommendations for these pairs. All you have to do now is to look for the pairs with a “thumbs up” icon beside it to see which pairs you can trade based on your trade and money management settings. This plan gives you 2 to 4 “copy & paste” trade recommendations based on Technical, Fundamental & Market Sentiment Analysis. This plan gives you 10 to 21 “copy & paste” trade recommendations based on Technical, Fundamental & Market Sentiment Analysis. Get all benefits of Single Trader Copy Service. Copy 10 to 21 trades across 28 different currency pairs every week. Unlimited use of the Unlitrader & Money Management Software.